The historical home of Glenn Hammond Curtiss is a place of wonder in many ways. Our team has made it a life mission to provide every attendee with an experience they would not be able to find elsewhere in America, but the Curtiss Mansion is more than just a big house, it is a monument to progress and history, listed right alongside the Capitol District in Washington, The Alamo in Texas, and even the “Welcome to Las Vegas” sign in Nevada, as a landmark in the US National Register of Historic Places. If you enjoyed yourself with friends and family at any of our facilities, or simply value the work we are doing and wish to help us keep the legacy of the American Dream alive, consider donating to us via Amazon Smile. 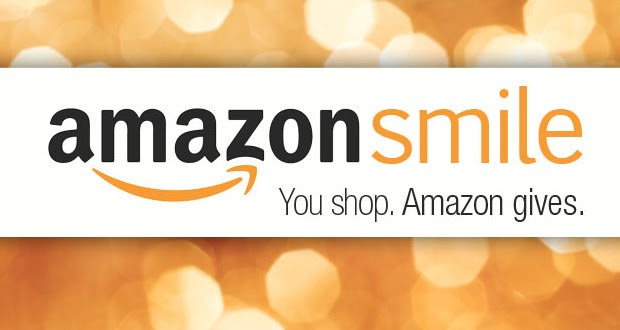 To do so, simply log in to your Amazon account and look for the Amazon Smile logo, or click on any of the images shown here. 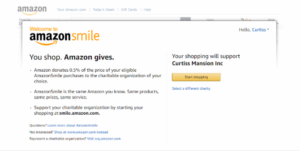 Amazon Smile will prompt you to select an organization to donate to. Type Curtiss Mansion into the search bar to start supporting the life and legacy of Glenn Hammond Curtiss, immortalized on this great Mansion, its gardens, works of art, and the people who continuously work to make it what it is today. The online retailer will donate 0.5% of every purchase you make to the Mansion, which will then go into keeping the grounds, restorations, setting up educational events, and much more. If you wish to contribute with something else that you might deem important for the legacy of this landmark, please visit our Donations page for more information.